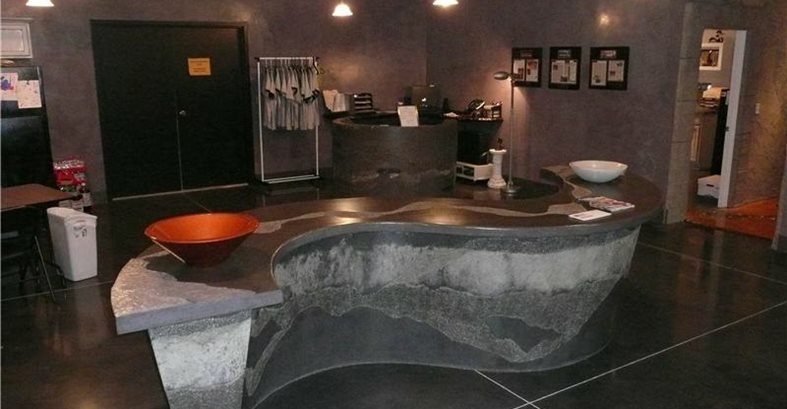 Having a showroom to display the concrete work you specialize in can make all the difference in winning over clients. By Bob Harris, The Decorative Concrete Institute, Temple, Ga. Concrete countertop in Bob's showroom. Example of more work found in showroom. Textured concrete wall in showroom. Sometimes simply showing prospective clients what your company's capabilities are can land you more work. Recently, this was the case for us on a high-end new home being built here in Georgia. It turned out to be a dream project we felt fortunate to be a part of. And it may not have happened without the impact of having a showroom. It all started with a phone call we received from a friend and student of ours who, along with his brother, are very successful concrete contractors. Their company was installing an integrally colored exposed-aggregate driveway for a client, and she told them that she also wanted some decorative work done in her basement. They felt this type of work was out of their league (as they put it), so they called us to see if we were interested. Initially, we met with Randy, the client's builder, and he informed us that Lori Higgs, the homeowner, wanted a black and white floor in her basement. The existing floor was concrete but had some chips, spalls, and other problems that would need to be addressed. After listening to Lori's desire for a black and white floor, my mind immediately went into brainstorming mode, already figuring out whether we would use a 100%-solids epoxy in black and white or perhaps a water-based stain. While I toured the different rooms in the newly constructed house, it dawned on me: Was the client even aware of the other decorative alternatives with concrete, such as countertops and stamped overlays? I suggested a visit to our showroom, and although Randy was somewhat reluctant (go figure), he asked Lori if she was interested in taking a field trip to "go see some of this guy's work," as he put it. Love at first sightSeveral days later, Randy and Lori paid us a visit, and they had an incredible experience. The first words out of Lori's mouth when she came through our front door were "Oh, my God! 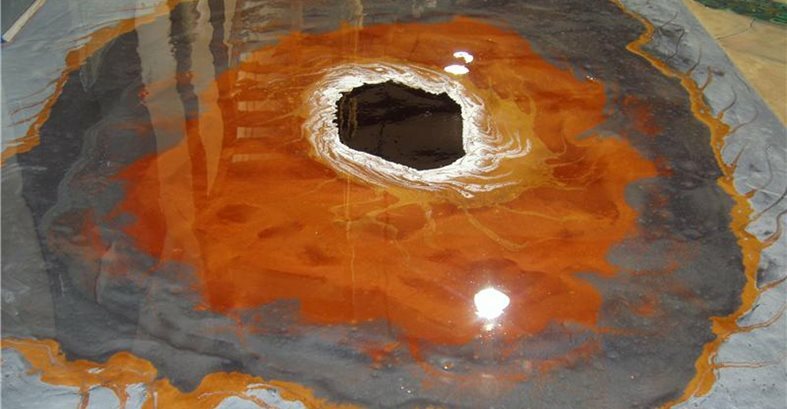 ", as she looked at a massive concrete countertop we have at the entrance to our showroom. 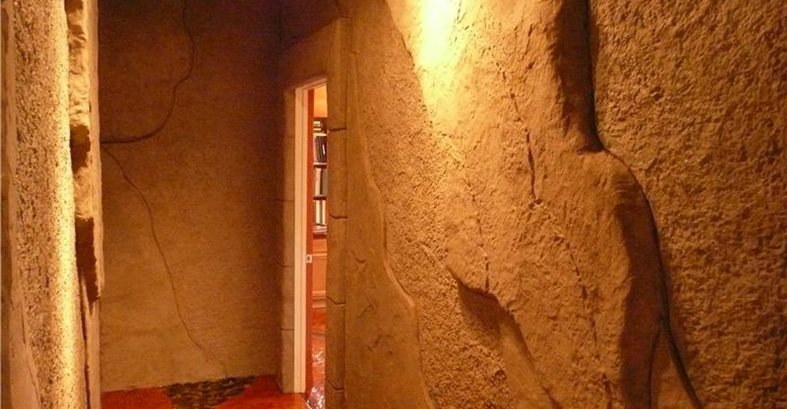 Decorative concrete is such a cool product (when done properly) that it has a way of luring you in, forcing you to touch and even caress it, which is exactly what both Randy and Lori did. I'm guilty of it every day myself, as I'm sure many of you are. When I walk by our concrete displays on my way to the warehouse, I can't help but run my hands across the sleek surfaces. During their visit to our facility, my wife Lee Ann took Randy and Lori from room to room, explaining what each application was and how it was done. On the tour, she showed them concrete countertops (both precast and cast in place), a wide variety of cement-based topping applications, vertical wall systems, and stained concrete. 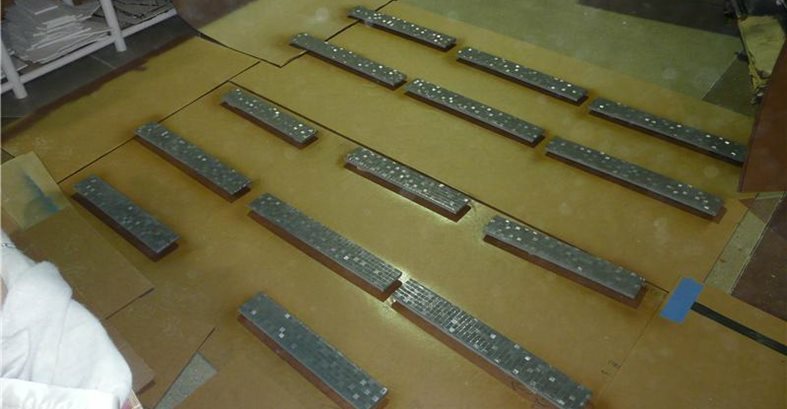 "You mean that's concrete?," Randy asked looking at several of the displays. And both of them kept making the comment, "We had no idea you could do that it in concrete." By the end of their visit, I think they were somewhat overwhelmed with all of the possibilities and needed time to digest everything they had just seen. A floor becomes much moreSeveral days later, and after I made one more visit to Lori's home, a project that started out as a black and white floor transformed into something much bigger, which I believe was a direct result of having a showroom to display our company's capabilities. It became a decorative concrete contractor's incredible dream project! 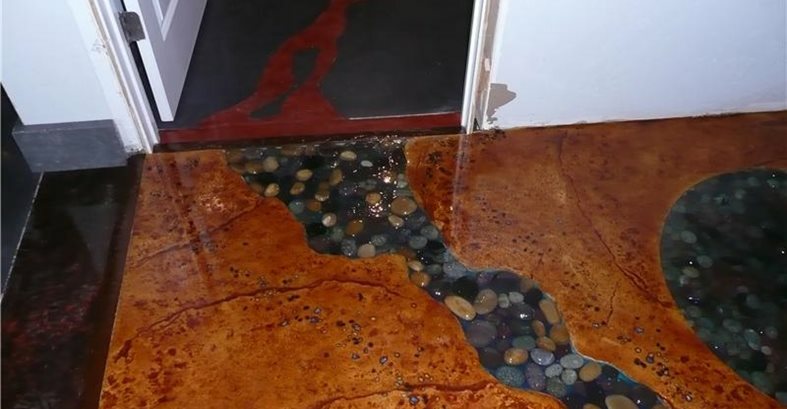 After her visit to our showroom, Lori was especially enamored with three applications: vertically stamped walls, cast-in-place concrete countertops, and a stamped floor overlay consisting of embedded river rocks to mimic a stream, with interspersed crushed glass. All of these elements were incorporated into her home. We started off in the basement by installing a beautiful stamped floor overlay with glow-in-the-dark aggregate running down the sides of a faux river bed along with large stepping stones on either side. (Read my article River Runs Wild for more details on how we did this floor.) Then we went on to install four custom concrete countertops in the basement to accent the new floor as well as three bathroom vanity tops, three precast concrete bathtub surrounds with hand-troweled finishes, a laundry room countertop and island, and in the kitchen, a concrete countertop with stainless steel inserts and trivets and an island top totaling over 100 square feet. I almost forgot the vertically stamped wall in the basement and the mammoth concrete countertop (like the one Lori saw in our showroom) that will be part of an outdoor kitchen. Start off smallDo yourself a favor. If you are just starting out in the business and do not have the luxury of having a large state-of-the-art facility to showcase your company's capabilities, don't be ashamed to set up a small showroom in your garage or basement. As your company grows, you can always build a larger shop. A contractor friend of mine built a small, very economical 900-square-foot shop where he proudly displays his work. More importantly, he now has an actual showroom where his prospective clients can go to see and touch his work. He says that having a showroom has absolutely helped him get more business. Here's the bottom line: In today's tough market, just being a reputable person that does good decorative concrete work simply won't cut it. To win your customers over, you must showcase your talents and display your work with pride, no matter how big your showroom samples are.